If your student loan balance is going nowhere, and if you use or have been enticed by your loan "servicer" to use a little piece of software called KwikPay -- you may wish to read ahead. Especially if your intentions are to minimize the actual dollar amount of interest (or interest + principle) paid. Background: doing a little research on something only tangentially related to student loans, I happened across a couple intriguing posts on reddit... have a read here, here and here. Immediately my intuitive hackles went up: something is not right. And thus the "little" research led to more research, and some pretty interesting discoveries. First and foremost: be informed that any company that uses KwikPay or Renweb is, in some way, affiliated with Nelnet. This is not good thing. 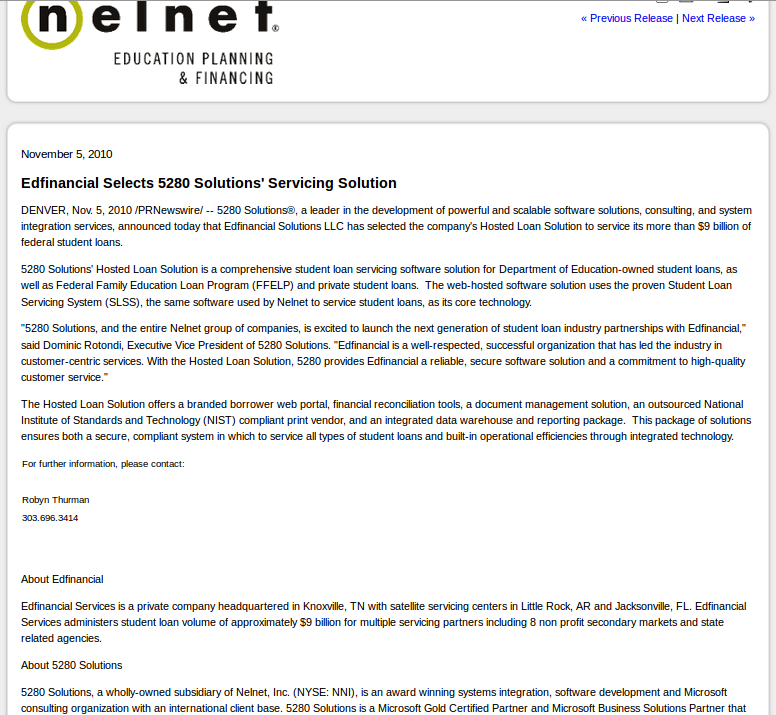 Nelnet, AKA "National Education Loan Network, Inc." is a behemoth publicly-traded, for-profit company that operates under a vast number of names and pseudonyms. Nelnet operates at least 47 subsidiaries (probably more today; but as of 2008 there were at least 47 -- see Footnote 1) and handles upward of $133.6 BILLION DOLLARS in student loans debts. This might be an admirable or impressive feat but for the reality that most of the "business" associated with these student loans was obtained illegally. Keep in mind that the $133.6 BILLION DOLLARS number does not include side deals where Nelnet has aggressively marketed its KwikPay malware and injected it into supposedly "competing" loan service companies such as Edfinancial, Charter One Bank, First Mark Credit Services, etc. How on Earth one company has been "entrusted" with so much student loan debt-handling is beyond comprehension. The fundamental problem with KwikPay is exactly like this redditor mentioned -- that the portions of your payment getting applied to interest and principle are seemingly random, especially for borrowers with multiple kinds of "loans" bundled (aka "consolidated") under this one servicer. This malware is programmed to apply interest vs. principle in a way that forces borrowers to maximize interest payments paid to the banks; this, of course, increases both the amount and the lifespan of the loan and makes paying it down that much harder. The formula for even "simple" interest: I = prt is easily manipulated when you let them play with the other variables in whatever manner they wish. Getting this straightened out is not only something they make difficult, but something that they actively discourage you from doing (or know how to do). - Purchased $6.1 billion of loans during 2014"
Nelnet made fraudulent and misleading statements on its website that consolidating the FFELP loans with Nelnet entitled them to a 6 month forebearance. By conducing them to consolidate FFELP-eligible loans before their grace period runs out, and by offering them forbearance for which they are not entitled, Nelnet yields loans with higher interest payments and loan balances that extend for longer than they otherwise would. JP Morgan and Citigroup delight in this. JPMorgan and Citigroup were named as aiders and abettors to Nelnet for "knowingly assist[ing] in the improper acts, plans, schemes and transactions"
Nelnet agents were required to make 100+ telephone calls per day soliciting people to complete loan consolidations; they were specifically instructed to present misleading statements regarding eligibility and savings over the life of the loan. However, the facts have shown that "individuals who consolidate their student loans with Nelnet end up paying more interest over the life of their loans and make payments for longer periods of time"
Very sadly and quite unfortunately... Nelnet, JP Morgan and Citibank's attorneys + lobbyists were (and still are) very powerful. They weaseled the judicial system to get this lawsuit thrown out (albeit from one man, not from anybody else who wishes to pursue it). The bad guys got a small victory -- it was “settled” for a measly $55 million (http://www.huffingtonpost.com/2010/08/13/nelnet-lawsuit-settled-st_n_681856.html), none of which went to distressed students who were taken by this scam. The original whistleblower – Rudy Vigil – had worked for Nelnet in the heyday of scamming students out of college – he ended up financially destitute and is reported to have filed bankruptcy. So with that little whistleblower blip taken care of, and the asset of a formula that has been "proven" to work with little or no takedown by the government, Nelnet now sets its sights on target: RenWeb. RenWeb is a recent acquisition. It at first appears to be an innocent and simple tool that can allow parents to track their childrens' school involvement; however, it is much more than that. Pieces of RenWeb allow students to apply for tuition and financial assistance... and it gathers both performance and income-sensitive data, data that is surely very valuable for targeting likely defaulters. Given Nelnet's historical actions, it's highly likely that this is an attempt to duplicate former success by getting the malware injection even sooner into the process -- by going after students' parents and a number of private or religious-based institutions. The CFPB is soliciting borrowers’ complaints. The agency invites borrowers to submit complaints online or call a toll-free number: (855) 411-2372. Expect to see a lot of lawsuits on the horizon for Nelnet and its cronies. Footnote 3: This author believes that you should never trust website software that uses ".aspx" in its URL bar. Footnote 4: Malware is computer software that injects itself into a system and adds significant transactional burden and "load" to systems. It does not go away on its own and must be forcefully removed.